Blogger, which famous with their blogspot.com free blog hosting service, provides RSS and Atom feed of blog contents for audiences’ and visitors’ subscriptions. However, bloggers, writers, authors or webmasters do not have insight into how many people subscribes to the blog posts feed, and Blogger does not provide complete detailed statistics for the feed. After Google bought over FeedBurner, Blogger service now offers an option to redirect all feed traffic to FeedBurner feed or other feed management and statistics providers. By redirecting to FeedBurner, important feed stats such as total number of subscribers, feed reads or feed aggregators used, live hits, item use, uncommon uses, item views, item link clicks and item enclosure downloads for podcast can be recorded and analyzed. The following guide will ensure that all feed traffic to the blog’s RSS and Atom feed will be handled by FeedBurner feed for most accurate and comprehensive stats. There is no need to modify HTML code or page template to change the feed’s URL link location, as all feed request to Blogger will be routed to FeedBurner, even subscribers to the original feed from Blogger. Sign in to Blogger account. From the Blogger Dashboard, click the More Options down arrow to open the menu for the blog you want to redirect the feed to FeedBurner or other feed management service, and then select Settings. Click on Site Feed Other link under the Settings tab. Under Site Feed section, type in complete FeedBurner feed URL link address in its entirety (including the “http://” or “https://” portion) into the Post Feed Redirect URL text field. Click Save Settings button at the bottom. A message “Settings Were Saved Successfully” will appear. 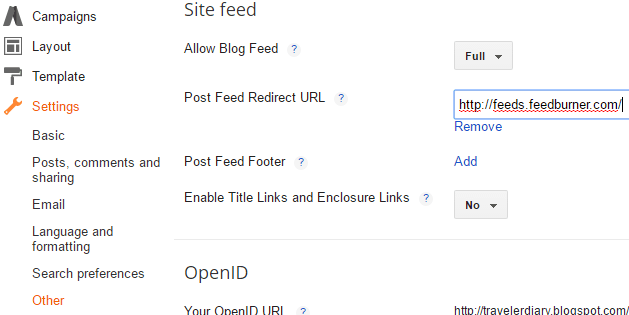 Blogger will now redirect all feed traffic for your blog to your FeedBurner feed. By integrating Blogger with FeedBurner, bloggers also has another advantage – that’s able to join FeedBurner Ad Network to insert targeted ads into the feed traffic.